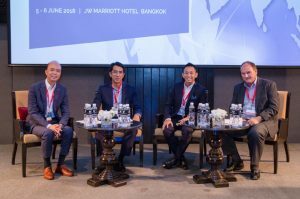 Bangkok (Thailand) – June 29, 2018 (travelindex.com) – Questex Hospitality Group, international conference producer, has concluded its two day Asia Pacific Hotel Investment Conference (APHIC) on 5-6 June 2018 at the JW Marriott Hotel Bangkok. Positioned as the ideal platform to gain access to new hospitality projects in the region, APHIC welcomed over 120 hotel owners/investors, operators, developers, policy makers, design/architect, and master planners in Asia Pacific. Day two featured two tours to a total of six hotels and serviced residences. Delegates leveraged the opportunity to visit some of the most notable recently opened properties in Bangkok, which is always slightly ahead of the curve in South East Asia in terms of concept designs and amenities. The hotels that inspired, include Bangkok Marriott Hotel The Surawongse; X2 Vibe Bangkok Sukhumvit; Somerset Ekamai Bangkok; akyra TAS Sukhumvit, Kokotel Bangkok Surawong; and ZAZZ Urban Bangkok. APHIC provided well-structured sessions with great insights and lively speakers. ͞Was a pleasure discussion how to unlock the potentials from existing assets through conversion, redevelopment and rebranding strategies with industry colleagues at APHIC. Old is the new NEW, or at least that’s the way we look at it,͟ said Tim Alpe, Chief Operating Officer – Hong Kong, Ovolo Hotels. APHIC is part of the acclaimed International Hotel Investment Forum (IHIF) Series of summits, the leading meeting places for the Hotel Community. IHIF has become known as the place where deals get done and the forum where senior level executives in the industry rely on as a tool for expanding and developing their businesses. APHIC – together with key partners – will present an opportunity for investors to gain access to new projects and new contacts from hotel owners/ investors, operators, developers, policy makers, design/architect, and master planners in Asia Pacific.